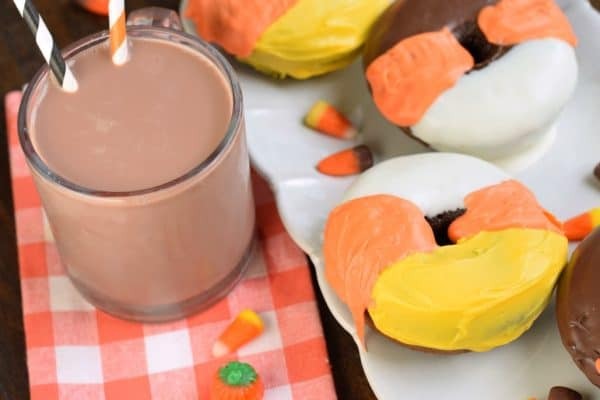 Adorable and festive, these Candy Corn Chocolate Donuts are easy to bake and fun to eat! Today’s recipe was created in partnership with The National Milk Life Campaign. While I was compensated to create this recipe, all opinions are 100% my own! It’s that time of year again! When moms everywhere are scrambling to make costumes, classroom treats, and Halloween memories. I don’t know about you, but Halloween is NOT my favorite holiday. I love fall, and the chill in the air, and pumpkin spice EVERYTHING, but the stress of Halloween with 4 kids was always too much for me. Buying costumes was out of my comfort zone, as I grew up with a mom who made our costumes every year, from household items. But I can’t sew to save my life. Such a conundrum. So every year my kids had homemade costumes that looked like a 5 year old made them, haha. I’m so glad my kids are too old for trick-or-treating. Well, I shouldn’t say that, they do still trick or treat, but now they make their OWN costumes. And I can still reap the best part of the holiday…the candy! One of my favorite candies is Candy Corn. I know, people either love it or hate it. And I’m all about the “autumn mix” too with the pumpkins and chocolate candy corn. 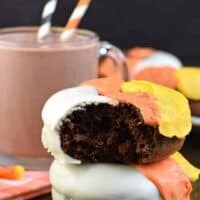 Today’s Candy Corn Chocolate Donuts recipe was inspired by my love for this Halloween treat…and a need to have something to dunk in my chocolate milk. I used my favorite Chocolate Donuts recipe as the base for this breakfast treat! While the Halloween holiday is filled with candy and other treats, I try to make it a priority to still enjoy the holiday while giving my family a drink I can feel good about. Chocolate Milk. The official drink of Halloween! Just like classic milk, chocolate milk has 9 essential nutrients in every 8-oz glass, including protein! 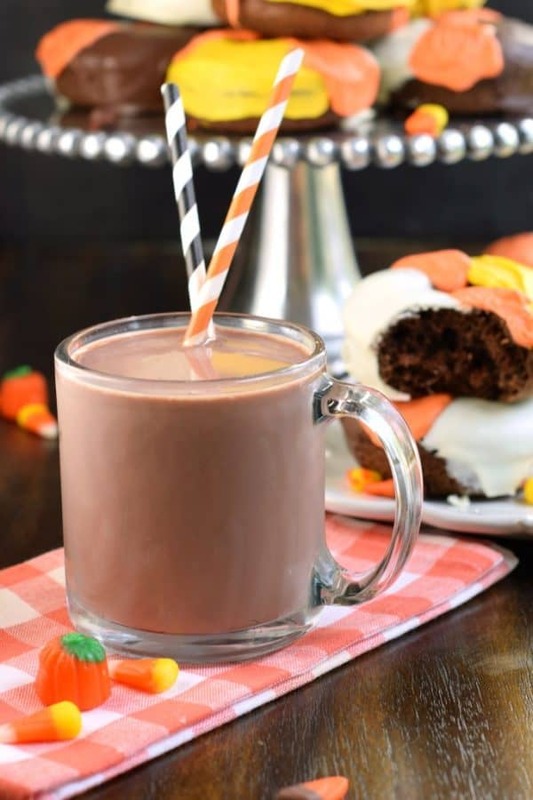 Not only do we love the taste, but it’s perfect for fueling hours of trick-or-treating fun! Milk provides 8 times more naturally occurring, high-quality protein than most almond milk (per 8-oz glass), plus it is minimally processed for a farm-to-table beverage your family will love. The Dietary Guidelines for Americans recommend that kids should get between 2 and 3 cups of milk/milk product per day, dependent on age. Chocolate milk counts as one serving! The American Academy of Pediatrics agree that chocolate milk is a positive trade-off for pop (soft drinks for you non-midwesterners, haha). KIDS LOVE chocolate milk, and moms feel good about serving it. Also, this mom, LOVES chocolate milk too! If you want more information about the National Milk Life Campaign visit Milk Life to get the details. 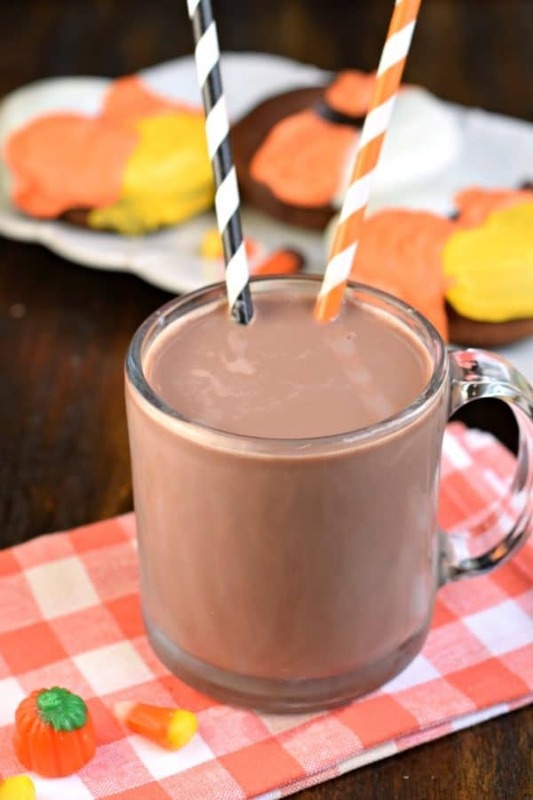 Visit AmazonFresh to get chocolate milk delivered today for a terrifyingly tasty snack! Start by preheating your oven to 325 degrees F. Spray a donut pan with baking spray (you’ll need enough for 12 donuts). I have TWO of these donut pans and love them! In a large mixing bowl, combine all your dry ingredients. Add your eggs, milk, and vanilla extract. 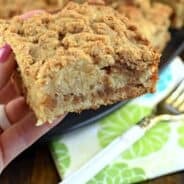 For this recipe you can use any kind of milk you have on hand, or make it extra fudgy by using CHOCOLATE MILK! Once that is well blended, spoon all the batter into a gallon sized ziploc bag. Snip off the corner and fill your donut pans evenly, about 3/4 full. Bake donuts for 12-14 minutes. Allow to cool in pan for a couple minutes, then flip out onto a wire rack to cool completely. To decorate, you will use dark chocolate melting wafer, white chocolate melting wafers, yellow candy melts, and orange candy melts. You can find these items in most grocery stores or on amazon! 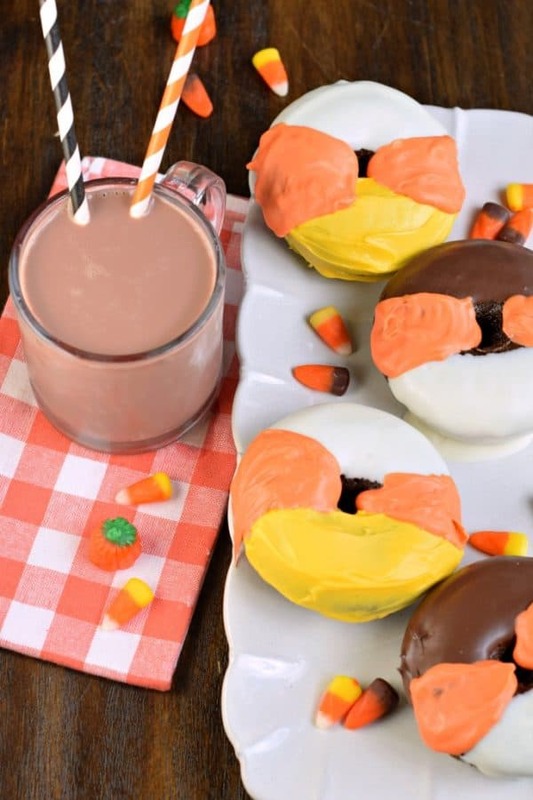 Decide how many “chocolate” candy corn donuts you will make, and how many regular. I did 6 of each. Start by dipping half of the doughnuts in the melted white chocolate (all the doughnuts will need this). Once that sets (about 10 minutes), dip the other side in the melted dark chocolate (for half) or spread the melted yellow chocolate on them. Now all 12 of your donuts need orange in the middle. My easiest trick for this was to spoon a dollop of melted orange on the donut then using an offset spatula spread it out. Voila. Done. And yes, they still kinda look like a 5 year old made them, just like the costumes I created, haha!!! Pumpkin Scones are a great choice in the morning. 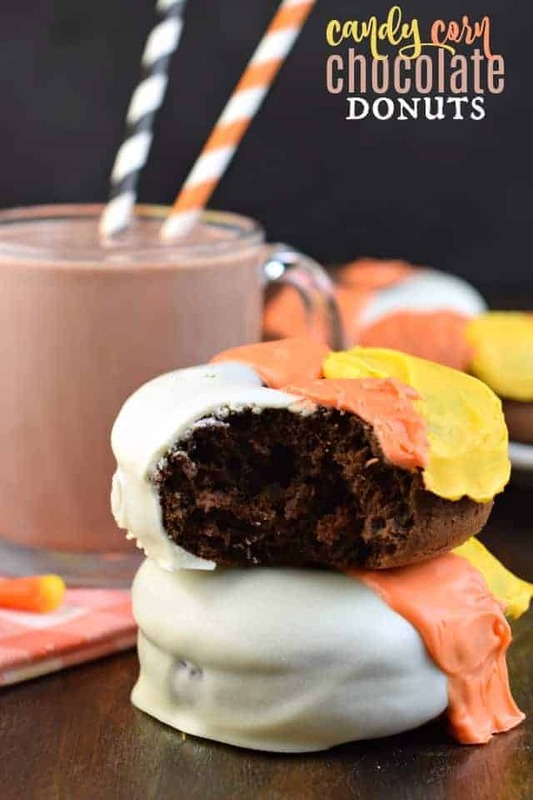 Packed with flavor from the double glaze, these are perfect with a big cup of chocolate milk! Chewy Peanut Butter Krispie treats topped with Candy Corn, Peanuts, and peanut butter candies are a great Halloween treat to go with your chocolate milk! Cookies and milk go hand in hand. 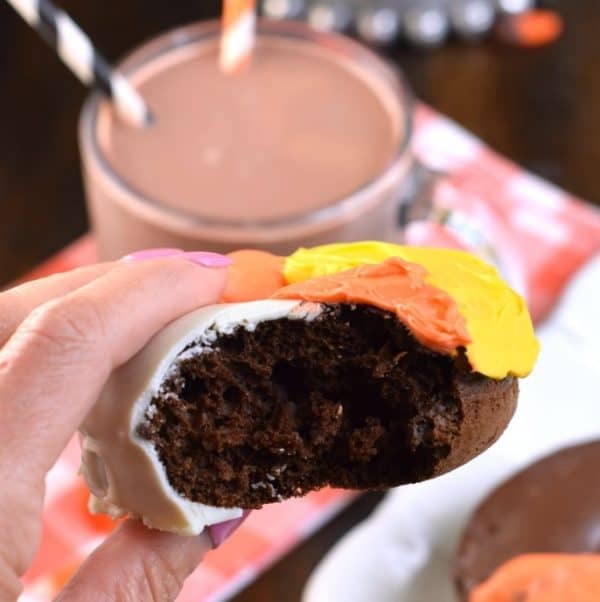 But Halloween Peanut Butter Cookie Cups with their spooky decorations go PERFECT with chocolate milk! Preheat oven to 325 degrees F. Spray donut pan (12 cavities) with baking spray. Set aside. For the donuts, mix dry ingredients in bowl. Beat in the eggs, milk, and vanilla. Beat until well blended. Fill each donut cavity about 3/4 full (I use a ziploc with the corner snipped to do this neatly). Fills about 12 donuts. Bake donuts in 325 degree oven for about 11-14 minutes. Allow to cool slightly, remove from pan to cool completely before decorating. 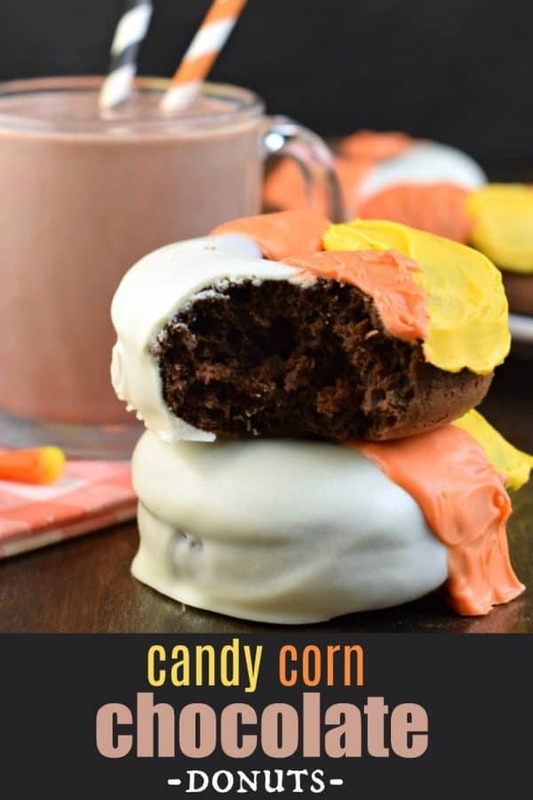 Decide how many "chocolate" candy corn donuts you will make, and how many regular. I did 6 of each. Start by dipping half of the doughnuts in the melted white chocolate (all the doughnuts will need this). 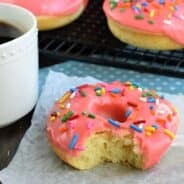 Allow donuts to set completely then enjoy! Best served within 2 days. Store in airtight container. I’m not a candy corn fan BUT these donuts look delicious! 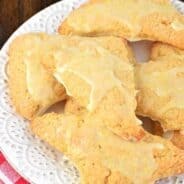 These look perfect and my kids will love them! Chocolate Donuts are my favorite! I love how fun and festive they are! I don’t like eating actual candy corns, but I love baked goods that look like candy corn, because they are just so dang cute! I love these festive donuts! I’m adding them to my Halloween list; I know that everyone in my family will go crazy for them! What a fun idea for Halloween! My kids would LOVE these! These candy corn donuts look so fun and so yummy! My kids would love them! So fun, my kids would be all over these! You had me at chocolate donut! 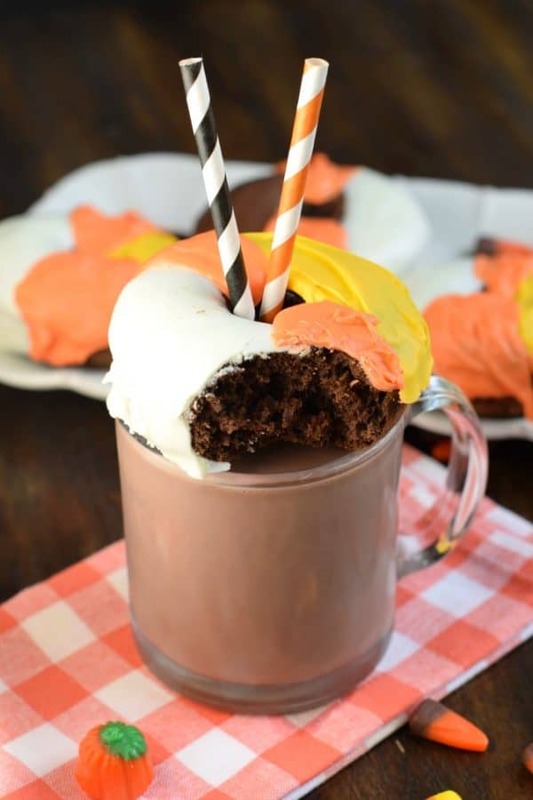 And I love the fun candy corn colored chocolate topping on them! Perfect breakfast or snack when dipped in chocolate milk!!! I am a candy girl fan girl, too! But also not a huge fan of Halloween (aside from the candy part of it LOL). I love that you used chocolate milk in these donuts- such a fun and delicious idea! My kids and their friends will go crazy when I set these donuts and the chocolate milk in front of them. Thanks for making me the hero mom of the neighborhood! Oh my! I can almost taste the chocolaty goodness from here! So cute too!